The second version of the Freerunner Navigation Board includes lots of new stuff to play with, while still providing the same feature set as the first version. The FRNBv2 realizes all features from the first version on the top side of the PCB. The bottom side is all about further expansion. Most of these chips are not very usable without connecting additional electronics to them. I'll add detailed descriptions of what I did with them to this page. The new ITG-3200 digital gyroscope detects rotations and measures their angular velocity. This enables the FR to be used as game controller or to improve navigation capabilities without GPS. A magnetometer senses magnetic fields. It can be used as compass for navigation purposes or to sense fields from other magnetic sources. A pressure sensor can be used for weather forecast or to measure the height above sea level if the pressure at sea level is known. If the height is known from other sources (e.g. GPS), the change in ambient pressure can be used to detect weather changes. This may be useful for gliding. This chip can source or sink current for up to four LEDs with a maximum of 25mA per LED. In addition to simple on/off states it can be programmed to blink or dim individual channels or a group of channels. Since the chip does everything on its own, it will continue to work even if the host cpu suspends. This allows the often requested feature to drain the battery even faster to notify users of incoming SMS or missed phone calls by blinking a LED even if the phone is suspended. A blink frequency down to once every 10 seconds and a widely adjustable duty cycle allows for very short flashes to save battery power. This is, well, a programmable oscillator from which one frequency output and the output enable pin are available at testpoints. My intention was to use it as 38kHz oscillator to generate the carrier frequency of common infrared remote controls. The output enable can be connected to a GPIO. After implementing a small driver, this should work as a generic remote control solution using lirc. This is similar to the chip which was used on the FRNBv1 to digitize analog gyroscope outputs. It provides only 12 instead of 16 bits of resolution, but this should be enough for most applications. The FRNBv2 does not use it for own purposes, so it is completely under user's control. The MPR121 from Freescale Semiconductor is a multi channel proximity capacitive touch sensor controller. Up to twelve sensor areas could be connected, but due to space restrictions, only seven channels are accessible at solder pads. It is not guaranteed that the chip will work as intended, but I think it's worth to test it. CLK: Clock output from the frequency generator. 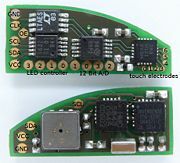 LED controller 0-3: LED current sinks. Connect LEDs in series with current limiting resistors from VCC to these pads. 12-Bit A/D 0-3: Analog to digital converter inputs. They can operate single ended or differencial. The reference voltage is VCC. Touch electrodes 0-6: Connect these pads to a larger conducting area to use it as touch sensor. The inputs 0-3 can also be used to drive LEDs. Refer to the datasheet for more information. The best way to connect the FRNBv2 to your Freerunner is to solder four wires to the VCC, GND, SCL and SDA pads at the top side of the board. SDA and SCL are available at test points next to the debug connector. VCC is accessible at the AUX switch. GND is available from the big decoupling capacitor below the backup battery. The FRNBv2 can be mounted into the free space below the GPS connector. I would reccomend to apply some adhesive tape to the GPS connector and the metallic cover on the main pcb. It prohibits short circuits which cause damage to the Freerunner or the FRNBv2. You should find all adresses listed below. The first PCBs arrived and allows to test single features. The progress will be documented here. The frequency generator LTC9604 consumes about 0.5mA even if the outputs are turned off. This is not a real bug but it would be nice to turn the chip off while unused. A small modification should make it possible to use one output from the LED controller to control the power. Reading exactly two bytes from the LTC9604 causes the I2C bus to lock up. The stop condition is not sent correctly and the master does not stop generating a clock. The chip works fine when programmed with a MSP430 microcontroller. Therefore either the Linux driver or the Samsung SoC (or both) are causing the bug. I'll try to resolve this, but I'm quite busy with other stuff. If someone wants to help, please contact me. Use *50V* 2.2nF capacitor for C5. fixed. NOR-Boot does not work if the FRNBv2 is connected. If you need the NOR boot only as emergency recovery, hold your finger onto the I2C-SCL pad (pay attention to ESD!) or connect the debug board cable (no need to connect the real board, the cable is enough) to "fix" the issue. Of course, this issue can be fixed permanently with an additional capacitor ;-) Solder a 15pF cap between SDA and SCL. A 0402 sized capacitor fits easily onto the test points at the edge of the board. This gitorious page lists all currently available drivers for the FRNBv2. The kernel drivers for the BMP085 and the HMC5843 are already upstream and will be shipped with kernel 2.6.36. All other drivers need some cleanup and more documentation to be accepted. I will try to get this done. If you're bored and want to help, please do so! The sensor-monitor is an excellent application to test the different sensors. Alternatively cat and echo can be used to communicate with them. Right now the interfaces to userspace lack some documentation. Either look at the source code or ask me if you are in trouble. The handheld-linux.com team kindly offered to retail the FRNBv2. You can find it here. Complete: everything you (possibly) want. Contains all chips as described above. Standard: contains everything except the frequency generator and the analog to digital converter. PCB: The bare PCB. You are free to buy only what you need. Right now, only the CAB boards can be ordered online. If you just want the PCB and/or a few parts, contact me or the nice staff at handheld-linux.com.